After reading Richard Vaughan’s four part series on the Valois Dukes of Burgundy, my interest in the history of the Low Countries was piqued. The medieval duchy of Brabant, along with Flanders, Holland, Hainault and Artois were all coveted by Philip the Bold, Duke of Burgundy in the mid-to late fourteenth century. Brabant was one of the most powerful of these principalities in the Low Countries and was subject to internal and external turmoil. 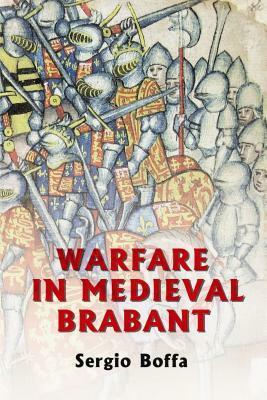 Boffa begins this book with a chapter on all the many conflicts experienced by Brabant during this time. John III, Duke of Brabant had no male heir and died leaving three daughters. He named the eldest, Joan as his successor and she married Wenceslas of Luxembourg. Joan would rule Brabant as duchess for almost fifty years, even after the death of her husband. A war of succession broke out after the death of John III. Louis of Male, Count of Flanders was married to Joan’s sister Margaret and thought he had a claim to the duchy. In addition, Brabant was engaged in some attacks on the Duchy of Guelders and other surrounding principalities attacked Brabant. It was a series of long drawn out conflicts. In the end, through alliances, Brabant was drawn into the Hundred Years War and finally succumbed to being annexed into the Burgundian Empire. After these chapters of overview, Boffa tells us more details about medieval warfare in this era. He covers the place of warfare in the history of Brabant, the causes of war, the different phases of the war and the strategy and tactics. Next he recounts the powers that were engaged in the warfare such as the Duke and the Duchess and their entourage, the household and the Ducal Council. The combatants during the war included the nobility and chivalry of Brabant, the urban militias, mercenaries, the artillery and the specialists. The most interesting chapters explain the organization of the armies, the revenues of the Duke, the declaration of war and mobilization, the movements of the troops, the means of transport, encampment and lodgings, provisioning, how orders were transmitted and the structure of the army. This is the most interesting part of the book. I found a notable anecdote here. Boffa explains that in the Low Countries, oats were fed to the horses. In the armies of England, the soldiers ate oats! The end of the book has an explanation of the size of the Brabançon army and military obligations and contracts in the Middle Ages. This is most definitely an academic and specialized book but anyone interested in the subject of medieval warfare will find it has substantial details about how armies worked. This entry was posted in Book Reviews, Medieval History Books and tagged book review, books, duchy of Brabant, French history, history of the Netherlands, Low Countries, medieval history, medieval warfare, Medieval Warfare in Brabant, Sergio Boffa. Bookmark the permalink.